In this sense, it’s a bit like 4e, but unlike 4e, the mechanics are fairly terse. 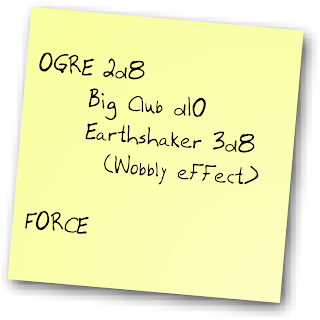 Perhaps unsurprisingly, they are designed to fit on a single index card. 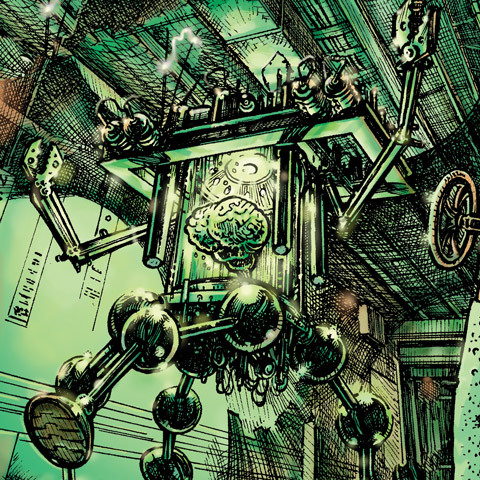 But despite this, there’s a lot of flux in this design space – there are some guidelines for creating characters, but (much like equipment) there’s room for some really crazy open ended stuff. Also, probably unsurprisingly, there’s a lot of Final Fantasy Tactics (and a touch of 4e) to be found in these classes. We’ll talk more about what that means once we have a few examples under our belt. 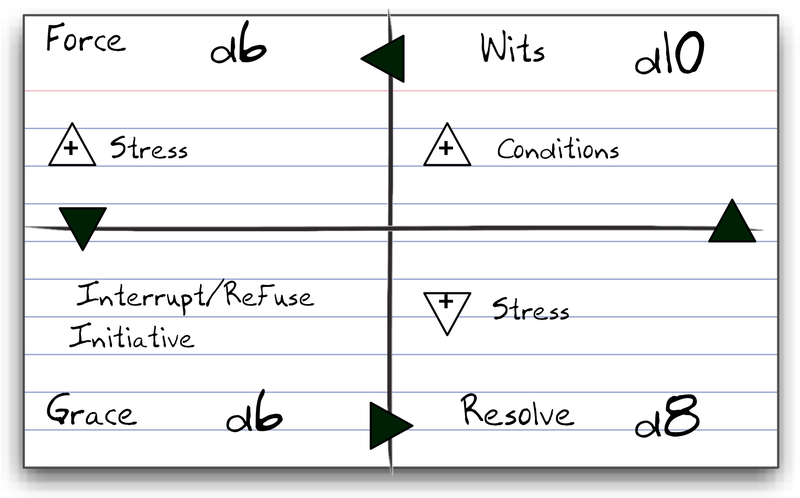 Characters start out with a class level of d6 in one of the starting classes. Exactly what the starting classes are is something of a setting decision, but for purposes of illustration, we’ll say that they’re Squire and Chemist. When the character acts, he gets to add his class die to the pool for any combat rolls. Out of combat, if the class is not relevant to the roll, the player rolls a d6 instead. We’ll get into how exactly those improvements are made when we talk about experience and advancment, but for the moment, just be comfortable with the idea that your class die is going to get bigger and as it does, it may open up the ability to switch classes. Next, we’ll start drilling into class abilities. 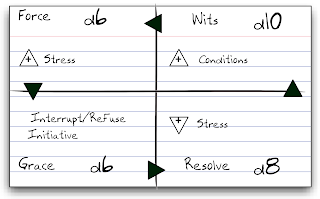 Index Card Tactics made use of distinctions – 3 per characters. For the unfamiliar these are descriptors without die values. Some of the ones we had in play included “Poor sense of direction” and “Very good at WANTING to be a knight”. Players may add a single distinction to a roll: if the player thinks the distinction will help, then it adds a d8 to the pool. 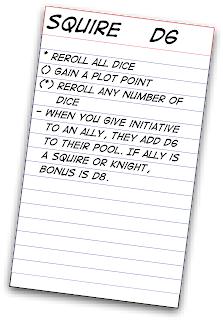 If the player thinks it will get in the way, then he gets a plot point and adds a d4 to the pool. Distinctions can also come up out of combat, though that’s a little fast and loose. They’re much more aspect-like in that context (albeit with no compel) and in practice a distinction can substitute for a die roll, for good or ill, when relevant. Not for every die roll, but for that whole range of not-critical-but-seeing-how-things-unfold kind of die rolls. For example, the characters might roll to try to find their way out of the forest or may opt to point out one character’s terrible sense of direction. If so, that character gets a PP and the party gets lost. Weapons provide a bonus any time you act in combat. Weapons have a category (for example, “Sword”) which has some relevant interactions with classes in terms of what classes can use which weapons. They also have a die value (starting at d6 usually) and often have some sort of distinguishing name (like “Knight’s Sword”). As they adventure, they may find or buy more powerful weapons, which are represented in two ways. First, the base quality may improve. The Training Sword d6 may get replaced with an Iron Sword d8, then Silver Sword d10 and finally Knight Sword d12. This improvement is pretty straightforward – it makes the die pool bigger, and these are the big-deal upgrades. – On success, player may opt to inflict Petrified status in lieu of damage. – d10 vs ice creatures. Armor works basically the same way as weapons do, but the bonus is applied when you’re defending in combat. Like weapons, armor has different types, die values and descriptors. The main difference is that while weapon F/X are about increasing damage or adding effects, armor bonuses are about reducing damage or mitigating effects. – Double benefit of selecting Resolve. Potions are basically canned effect dice that spare you the trouble of rolling. Right now there are only 2 kinds, healing and Remedy. They have a die value (usually d6 or d8) and they’re applied as recovery against damage and conditions respectively. More specialized potions exist that get a +2 step effect, but only work against specific conditions. So a d6 remedy potion operates at d6, but a d6 Soft potion works at d10 vs. Petrification. 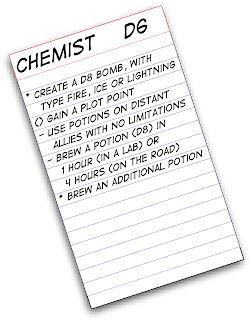 To simulate the “always works” element, I may demand that any specialized potion be built on a base of d8 (effectively d12) but I might also like the idea of cheapo potions that kind of work. Ok, that’s a lot. Probably enough for today. Classes are probably next. This entry was posted in ICT on May 8, 2012 by Rob Donoghue. This is not technically part of Index Card Tactics, though it’s related, in that another part of ICT is that it uses situation generators like Two Guys With Swords. This is another such tool (and don’t worry, I’ll be getting onto classes and equipment and so on). 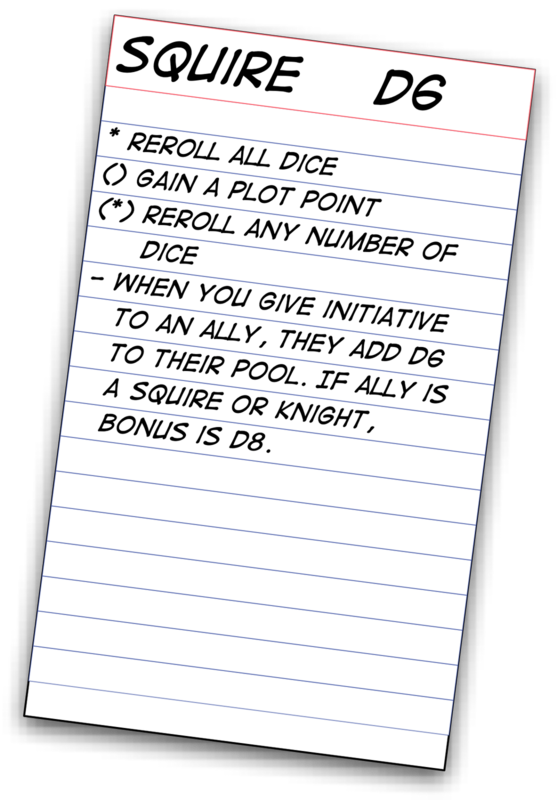 On the card they have received, the player now writes down something bad that might happen to the person named. This should not have a lot of details outside of the character, so “Stripped of their title” is good but “Stripped of their title by the Cardinal” is not. On the card received, the player now writes down a good outcome, flavored by the bad one. It should not merely be “The bad thing doesn’t happen” but rather an outcome that might be hoped for over and above mere nullification. To continue the example of stripped of title, “Be honored by the king” would work well. Player looks at the situation as presented and – privately – writes their rating on the card, representing their interest in seeing this in play. Ratings are from 0 (I actively hate this, and never want it to see the light of day) to 5 (This is AWESOME, I totally want this) . Step 7 is fre-form as presented, but if you’re using a game with an existing cast of characters “in play” (like a Dresden Files City, a tech Noir playset, or even something like Apocalypse World’s fronts) then the character selected should be drawn from that list, or tied to that element. In step 11, Player rating is important to determining plot relevance but it’s also a useful yardstick for difficulty. That is, a low-interest situation should also be one that is reasonably easy to resolve. In Step 11, If interest is across the board low, then that may be a reason to check your table. Is it that your players have radically different tastes and they’re spilling on each other? Are they looking for more of a monster smash this evening? Do the NPCs really not grab them? Only you can really know your table, but take it as a cue to think about it. This entry was posted in Generator, ICT on May 7, 2012 by Rob Donoghue. I was talking about this with Ryan Macklin last night and I had a moment of “huh, I should write this down” so here it is. At Pax East, I ran a game of what can probably best be described as tabletop Final Fantasy Tactics. Early in the con I had run a game of Cortex+ D&D that had gone well, but I’d been struck by a desire to hack it further, and the end result is something that you can still see the Cortex+ roots in, but is kind of its own beast. 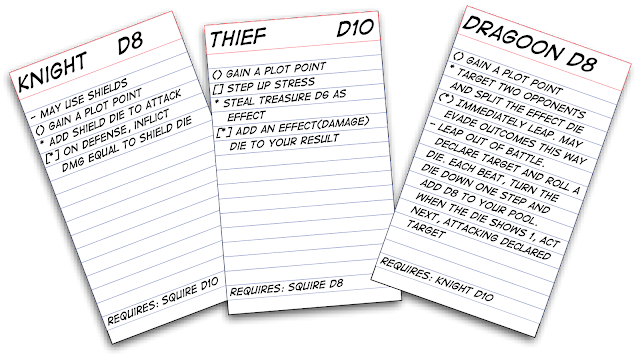 One of the essential rules of this design was that everything could be done on index cards (or post-its), and the character “sheet” ended up being a set of cards, one for stats, one (eventually 2) for class, one for distinctions and one for equipment. Now, before I get into the details of this, let me provide a little data on how play worked for context. Initiative was based on the Marvel model that Fred came up with, and on your go, you took an action and chose which stat you would use as part of the roll. Once that happened, that was the mode you operated in until your next action, which was relevant for defense rolls, and which had tactical implications that I’ll explain in a minute. The important thing is that you got locked into that mode. Now, the other details: The black arrows represented advantage, so Force had an advantage over Grace, which had an advantage over Resolve and so on. The mechanical upshot of this was simple – in a conflict, the stat with the advantage would step up one. Thus, if this guy used Force against someone else using Grace, his D6 would be bumped up to a d8. This is not a huge bonus, but it offers an additional incentive to stat choice beyond “The best one”. So, that makes the choices pretty straightforward. But what about the GM? You definitely don’t want to keep track of all that. And so you don’t – these are PC rules. For enemies, life’s much simpler. 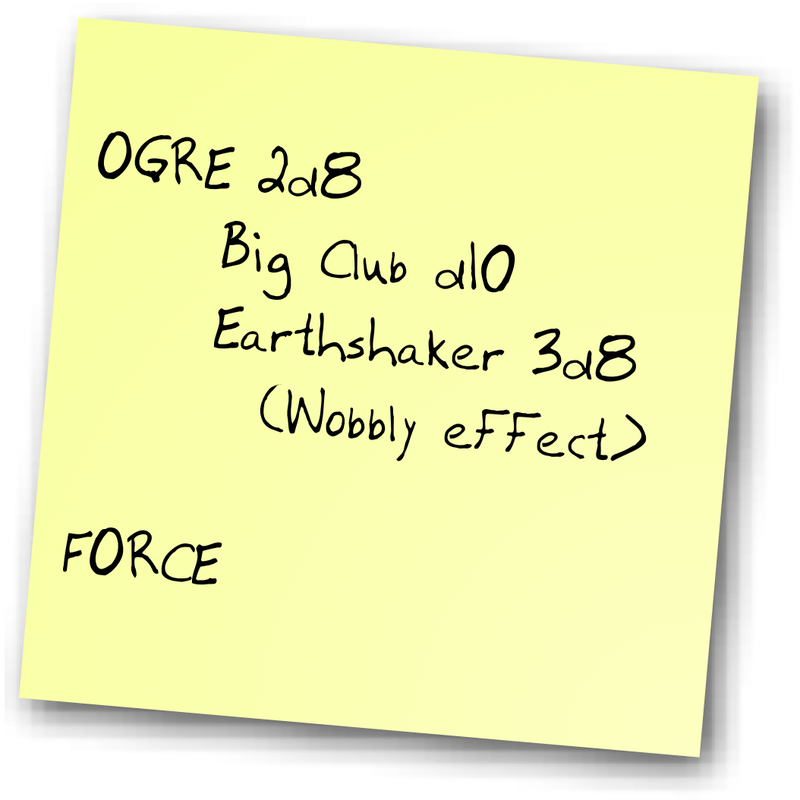 Just a few notes for a die pool, a special attack (If he used the earthshaker dice, he didn’t do damage, but imposed the wobbly condition) and a note that he was a force creature, which suggested what he was strong or weak against. Simpler monsters didn’t have a stat at all, and boss monsters might have two that they can switch between. Easy on the GM, but creates a broader landscape of choices (especially when there’s a range of enemy stats – do you want to use wits on the ogre knowing that there’s a RESOLVE Troll on the board?). Anyway, there was more stuff with classes and gear, but I figured I’d start with the basics. 2 – This worked startlingly well. 3 – In the future I might consider making this hidden information for the video-gamey reason of offering an avenue (SCAN) to finding this out. But that might also be too much work. This entry was posted in Cortex, ICT on May 4, 2012 by Rob Donoghue.